Google’s recent focus on increasing mobile ad revenue has led the search giant to dissolve Google Places into Google+ Local Pages. This consolidates all of Google’s business listings into a single entity that can be used throughout Google+, mobile, Maps and search. It’s a move designed to help Google maintain its reign in online advertising while making it convenient for users to find enhanced local listings through any of Google’s network of services. SearchEngineWatch.com reported on the rationale behind the rollout. “There’s just this huge opportunity around mobile, because your mobile device understands location to provide you great information, to provide great advertisements and context for users there,” said Marissa Mayer, Google’s VP of product management. Google is planning to roll out the new format over the coming months and anticipates a warm response. Users should appreciate the convenience of expanded access to local listings, as well as the addition of Zagat reviews as a free service. Business owners should also benefit by having their listings appear throughout numerous Google services while still being able to manage their information through Google Places for Business. If you happen to be one of the companies that created a Google+ Page for your business, you’ll continue to have two pages for the time being. 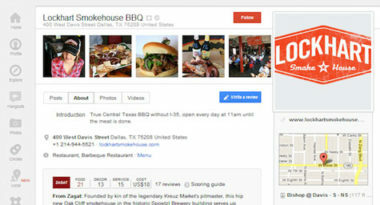 Your Google+ Page will remain separate from the new Google+ Local page for now. However, Google has said they will soon have news on how to link the two. Google acknowledged that mobile advertising is one of the fastest-growing and largest areas for the company. In fact, more than half of Google Maps usage is from mobile phones. With BIA Kelsey forecasting that mobile ad revenue will reach almost $8 billion by 2016, with local comprising nearly two-thirds of that total, it’s clear why Google has been pursuing the thriving mobile ad market. The company already generated $2.5 billion in mobile ad revenue in 2011, which was a 150 percent increase over the previous year. The momentum for mobile ads has only grown stronger with consumers increasingly on the go and businesses hungry to reach them at any time and any place. Currently, the click-through rate for mobile ads is 72 percent higher than on desktops. During the 2011 holiday season, 52 percent of adults used their mobile devices while shopping in traditional stores, according to Pew Research. Also, Marin Software predicts that mobile devices will represent 25 percent of all paid search ad clicks on Google’s network by the end of 2012. The emergence of Google+ Local can be attributed to Google’s desire to maintain its dominance of the global online advertising market, as well as the fact that 96 percent of the company’s earnings come from advertising. Google is striving to position itself as the single source for everything on the Internet and their focus on evolution could bring them closer to achieving that goal while exceeding their greatest ad revenue expectations. To learn more about Google+ Local and discover the latest ways to incorporate mobile ads into your marketing strategy, contact MDG Advertising.